I love our little town! Every year at the beginning of the school year we have a big pep rally called Meet the Raiders. The middle school and high school football and volleyball teams are introduced. The middle and high school year cheerleaders and bands perform. The varsity teams are introduced individually. Little girls who attended cheer camp with the high school cheerleaders do a cheer and dance. Before Meet the Raiders Ryan got to help Sam put his Varsity decals on his helmet. I love this tradition! This is the first year B was able to make it through the entire thing. We used to have it in the high school gym. This year it was held outside at the stadium. It was still crowded but a little more tolerable for B. Having it outside also let the booster club show off the new tunnel. Ryan got to work the tunnel. B did have a brief meltdown when we got there. He was overwhelmed with the crowd and noise. And the stands were a little crowded. A friend of ours is a principal in another district and she was great with B! She convinced him to come back to the stands and sit by her husband. He got his own little set up. She even took him to get skittles. 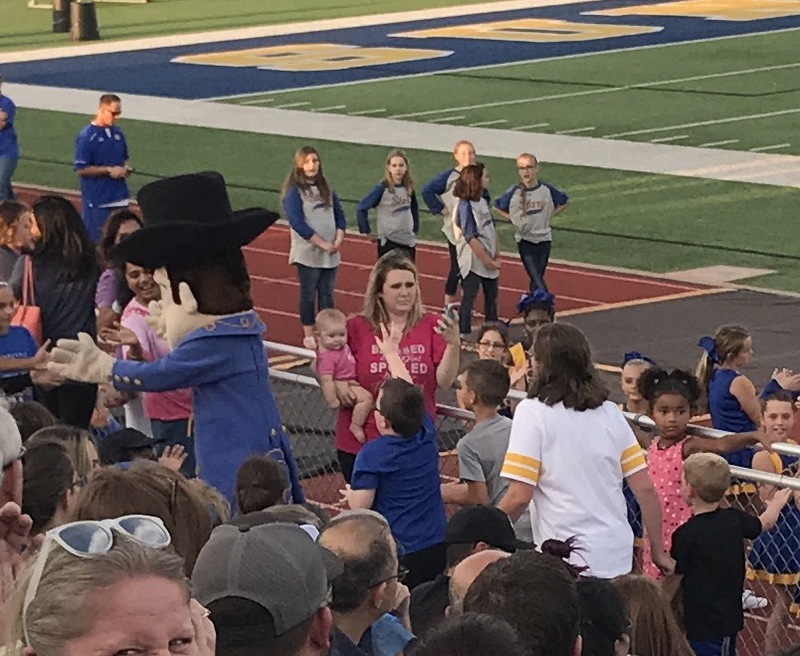 During the school song, B held hands with her and her husband. Have I said how great our community is???? My absolutely favorite part of a wonderful night was when our mascot, Rowdy the Raider came out. When Rowdy was introduced, B snapped to attention. He ran after Rowdy like he was a rock star!! Then he stood at the fence dancing and trying to get Rowdy's attention. It was a great night for our family and our community!